The Axino is where it all started for BLUE. In the latest rendition we’ve taken the Axino to a whole new level. The distinct feature is our proprietary Kamtail tube shapes that not only make the Axino fast, but also an exceptional handling machine. It can be equipped with Shimano Dura-Ace Di2 or Ultegra Di2 for electronic shifting or Shimano Dura-Ace, Ultegra or 105 for mechanical shifting. Tapered head tube provides front-end torsional stiffness for precise steering and control with minimal aerodynamic sacrifices. An oversized BB shell is coupled with a larger down tube and chain stays to provide increased rigidity for out-of-the-saddle sprinting, maximum acceleration, and optimal overall efficiency. High-Modulus Continuous Fiber Frame Technology (CFFT) is a process by which the full-length carbon strands run throughout the bicycle for increased strength while decreasing weight. NOTE: The pictures are for representation only and may not match the color or build items listed below. 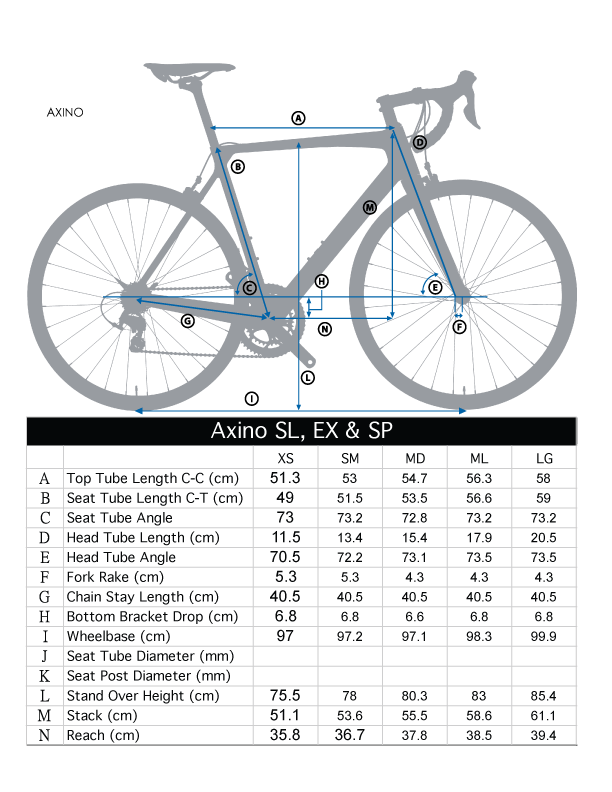 Please refer to the configuration list for the components for this bike price.